Representatives from multicultural football project World Utd, Glenavon FC, Irish Football Association and the Amateur league all came together to take part in a train the trainers event hosted by Anti-racism Educational Charity Show Racism the Red Card in Partnership with the Irish Football Association and Football For All. The training day was facilitated by Dee Kinning Education Coordinator for the Scottish Office of the campaign, and took place in Belfast, Northern Ireland, on Tuesday 17th April. 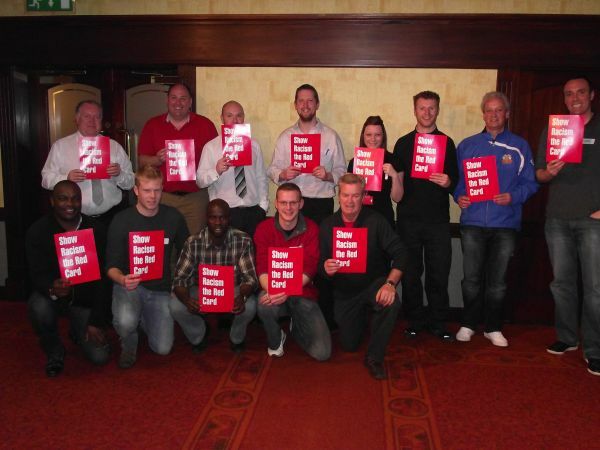 The day consisted of two training the trainers workshops designed to equip participants with the skills and knowledge to deliver anti-racism workshops within their own communities using Show Racism the Red card anti-racism educational resources. Dee Kinnning said, "I am delighted to say that this is the second time I have been invited over to Belfast by the Irish Football Association and Football for All to deliver training to Youth and Community Workers and Volunteers. Each time I have met inspiring individuals who are delivering an incredible amount of work promoting equality for all. It is fantastic to be part of the wider agenda in assisting to promote race equality within a modern Northern Ireland using the role model status of football and football players to engage learners."